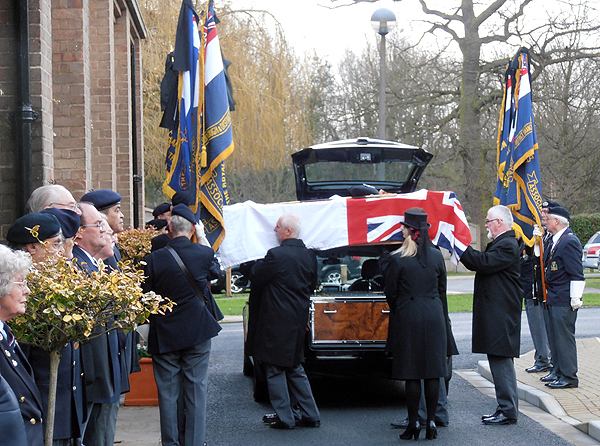 On Friday 17th January 2014, members from No 6 Area Royal Naval Association gathered at Peterborough Crematorium to pay their respects to shipmate Tom Tubb, who sadly ‘Crossed the Bar’ on Wednesday 18th December. Thomas Tubb was born on the 5th June 1943 in Harlington, Middlesex; the third child of Gerald and Ivy Tubb. 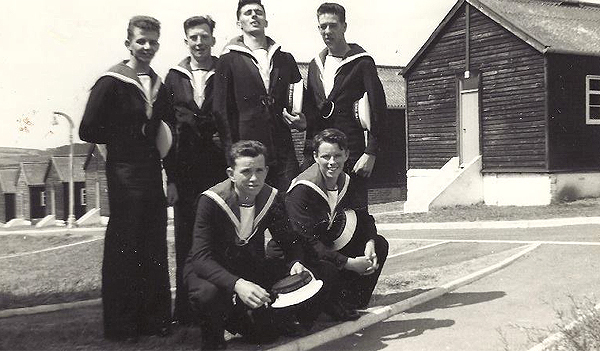 He joined the Royal Navy as a Radio Operator in 1961, Tom was based at a number of shore bases and ships such as Mercury, Adamant, Plymouth, Victory, and Kemerton (Jafir) before being drafted to Gibraltar at HMS Rooke. Tom met Patricia Moffat in Gibraltar and they were married in April 1967. Their daughter Victoria arrived later that year followed by son Peter in 1969. Back in the UK, Tom continued his service at Mercury, Victory, Bulwark, Hasler, Naiad and Euryalus before being drafted out to Brunei in 1972. After a couple of years in Brunei with his family, Tom applied for officer selection and returned to the UK, joining Royal Naval College Dartmouth, in 1975. As an officer, Tom served onboard Tenacity, Kingfisher, and Avenger, before joining Alacrity as a Lieutenant Commander in 1980. 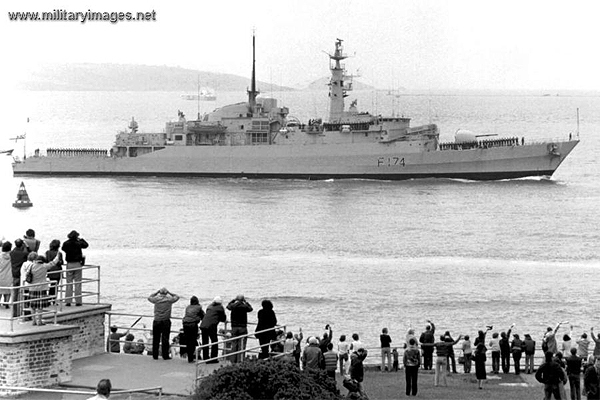 Following the Argentine invasion of the Falkland Islands in April 1982, Alacrity was one of the first ships to arrive at the Falklands; she withstood 10 attacks, emerging unscathed, and was dubbed ‘HMS Miracle’. It was only because the ship’s gun could not be repaired, having fired 453 rounds, that she returned to Plymouth – one of the first to arrive home having sailed 30,000 miles. 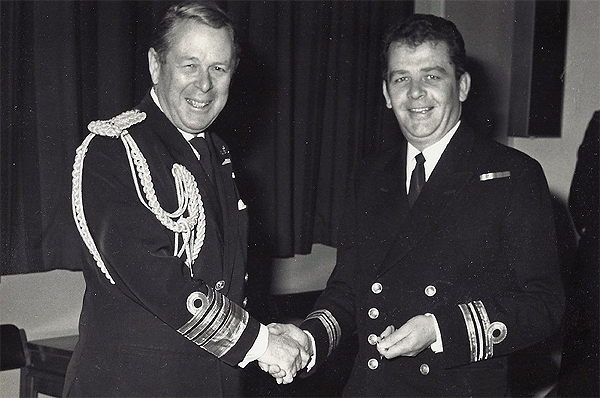 Tom was a remarkably stable and mature influence for good aboard Alacrity throughout the busy days of the Falklands War. Thus much of the success achieved by the ship is due to him. His many other qualities, particularly his wit and good nature, were a cornerstone of the wardroom during the entire commission. 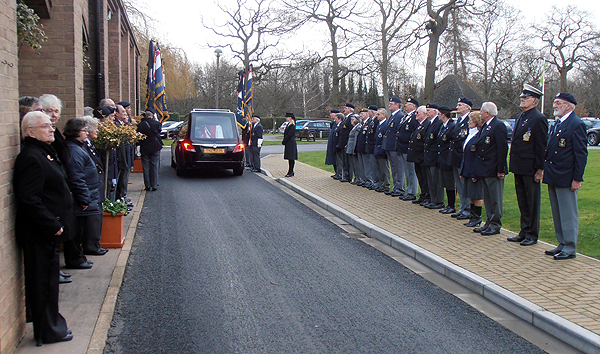 A posting to The Netherlands followed for Tom and, as ever, Patricia went with him; his final job in the Royal Navy was in the Maritime Tactical Trainer, before voluntarily retiring in 1986. He joined Ferranti for a spell before accepting a position as a Lieutenant Commander in the Sultan of Oman’s Navy serving near Muscat in Oman. This proved to be one of the happiest periods of his life, with Tom and Patricia thoroughly enjoying the ‘ex-pat’ lifestyle, despite the family’s concerns for their safety during the Gulf War in 1991. Tom effectively ceased working once they returned to the UK and they settled near Jedburgh in the Borders. Sadly he lost Patricia to cancer in January 2000. Tom moved down to Peterborough at the end of that year to be closer to family. Victoria persuaded him to join the Peterborough branch of the Royal Naval Association and he quickly became involved. He became Chairman of the Peterborough branch, where he is remembered for ‘his highly-valued experience and support, as well as his organisational and managerial skills’. Tom took on the additional responsibility of Area Secretary for No.6 Area and even became President of the Sea Cadets in Peterborough too. He took great pride in his appearance – always a shirt and tie, and shiny shoes. If an occasion required it, you knew Tom would be ‘suited and booted’ and always ready on time. 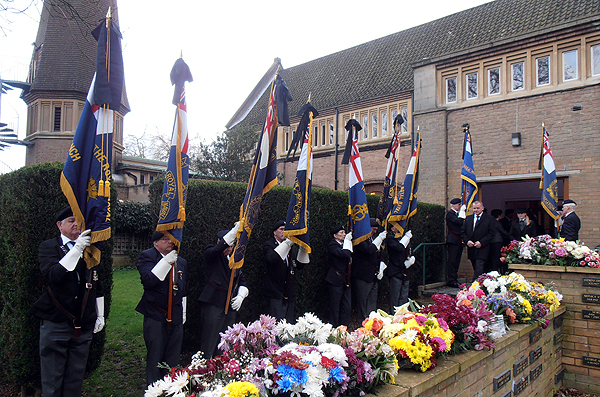 With the sad news that Tom had crossed the bar, it was no wonder that so many of his shipmates from Peterborough Branch, and No 6 Area, came to pay their respects in a final act of farewell to a highly regarded shipmate. 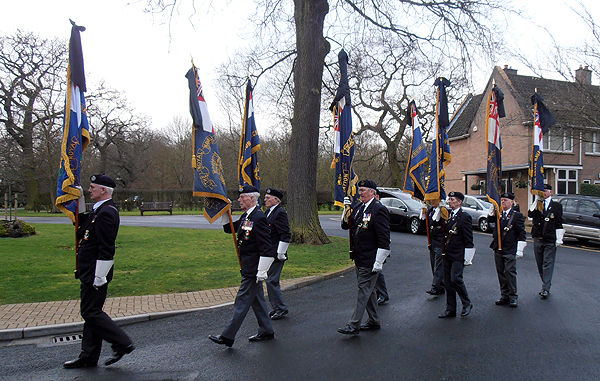 As the time drew near for Tom’s service, Standard Bearers from within No 6 Area, formed up in front of Tom’s hearse. Standards were carried as the procession moved forward. Family, friends, and shipmates lined the route. 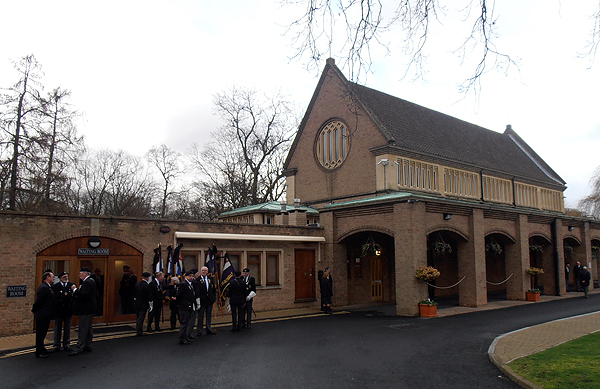 Tom’s coffin is carried into the chapel. 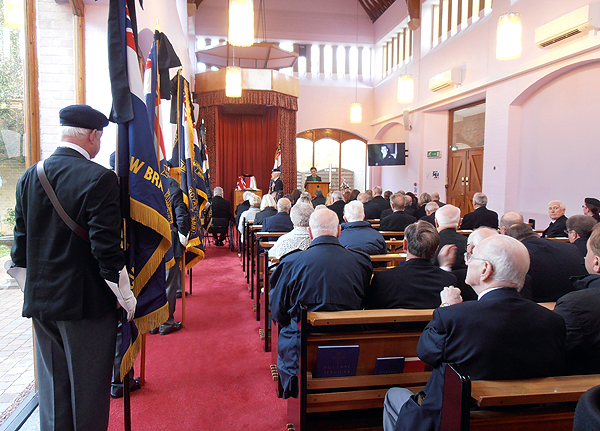 With everyone inside the chapel, the service began with tributes and memories of Tom and his life achievements. 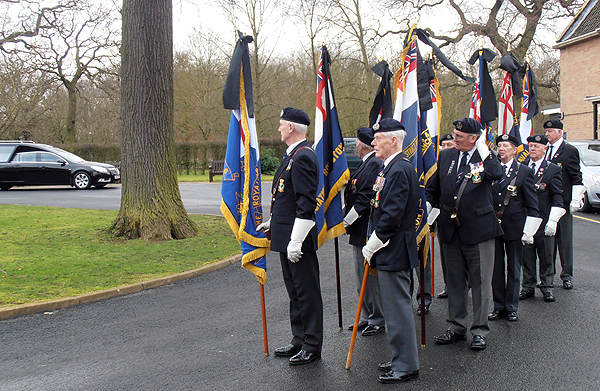 After the service, Standard Bearers paraded for a final time. 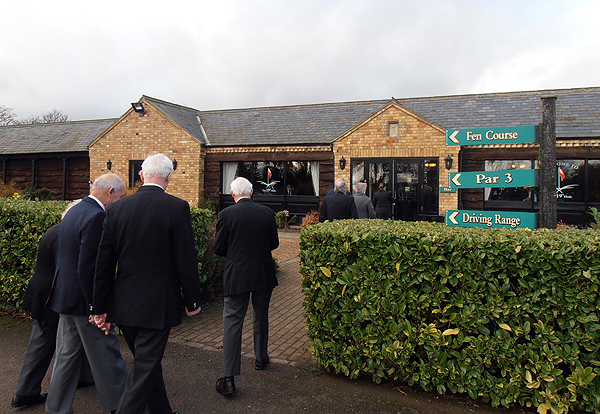 And then, a chance to sit down and remember Tom at a reception held at Thorney Lakes Golf Club. A sad day, but a well deserved send off by those who knew Tom; for those that did not know him personally, it was pretty clear that he touched so many lives and was loved by his family and friends, he made a difference and will be missed by so many. Tom and his wife Trish were a lifeline to me in my first sea job in HMS AVENGER. 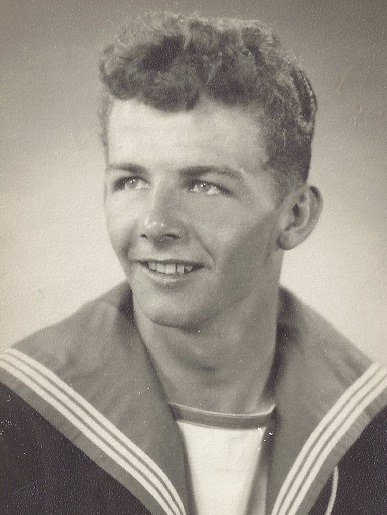 Tom was the Signal Communications Officer and they often invited me home for a night or the weekend as I settled into the Navy ashore and afloat. They were a lovely couple and Tom and I stayed in touch for the subsequent 35 years. To me he epitomised what it was to have a shipmate. In the last few years, he would often ring me up to discuss how the RNA was developing. I send my deepest commiserations to his family, he was a great guy! A personal note: I would like to thank Tom’s daughter Victoria for permission to photograph Tom’s funeral as a record of the day, and for providing me with a copy of his eulogy to use when writing this page. I never met Tom myself, but was proud to show my support, and to pay my respects to him and his family. Rest in Peace shipmate.